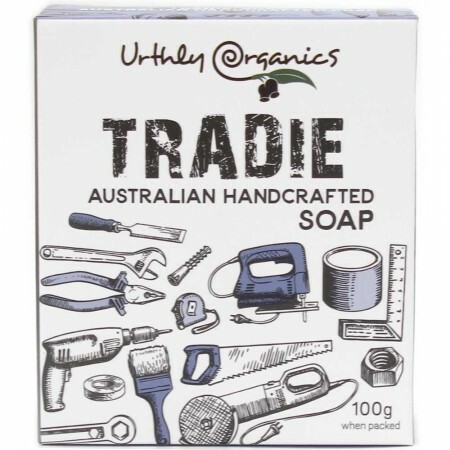 A palm oil free bar soap to exfoliate grease, dirt and grime. Made in Central Victoria, Australia with Eucalyptus, Orange and Tea Tree oils. Free from SLS, SLES, parabens, fluoride, titanium dioxide, glycols, fragrance and mineral oils. 100g. Great for removing grease, grime and dirt while leaving your skin soft and clean. Contains Eucalyptus, Orange and Tea Tree oils, plus Rosemary, Aniseed, Cedarwood oil. Exfoliates using Australian Red Clay, Australian Black Magnatite, Australian ground coffee, white sand and Frankincense granules. Saponified coconut oil, *olive oil, coconut oil, *cocoa butter, macadamia oil, rice bran oil and *hempseed oil, orange, tea tree, eucalyptus, rosemary, aniseed and cedarwood essential oils along with coffee, frankincense and white sand granules enriched with Australian black and red clay's. *Organic ingredient. Bought this for hubby but seem to disappear quickly!